Motorcycle production was limited, but the company produced a considerable variety of four stroke 125 singles and 350 twins, along with a series of roadgoing shaft drive four cylinder models which have become very collectible indeed. Not quite as collectible as their racing models however, which, on the rare occasions they come onto the market, can fetch over a million dollars. 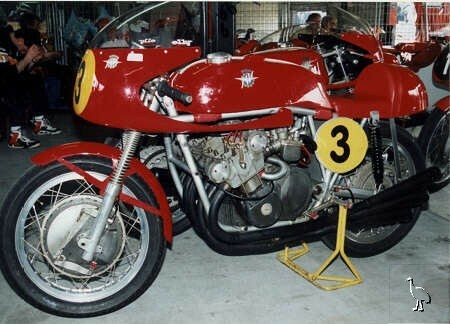 Apart from MV's success on the world's racing circuits, a strong contributing factor to the rarity of the marque's racing machinery may be that, so the story goes, Count Agusta used to bury the previous season's bikes under the runway at the helicopter factory to prevent competitors from stealing his secrets.